This stage, described as mid-mountain, is divided into two distinct parts. The first, which passes through small enclaves with services, serving as a point of contact and training for the subsequent ascent that begins in Villafranca de Montes de Oca, with hard slopes, although not very long. In this town pilgrims are advised to purchase supplies, as they will face more than 12 kilometres without services and very few drinking water fountains. The old and formally feared Montes de Oca guides the walkers along dirt tracks, a solitary journey until reaching San Juan de Ortega, a small Jacobean enclave with a hostel and a Romanesque church. Despite a number of pilgrims ending the stage here, the greater number of services on offer in Agés encourages many to cover the remaining two kilometres to its locality. The day begins in Belorado (543 kilometres to Santiago), a village dedicated to the fur industry to which the walkers say goodbye after facing another dangerous junction with the N-120, signposted but with no pedestrian crossing. After crossing the river Tiron via a wooden bridge, the trail continues parallel to the road, leaving the asphalt on the right. Continuing in this manner until a Red Cross building and a petrol station, from which another route begins, firstly on asphalt and then on earthy ground that leads the pilgrims to Tosantos (24.9 kilometres to Agés), the first town on this stage. After leaving on the right some warehouses and passing in front of a picnic area with a fountain and barbecue facilities, its shade is of help in summer, the route and enters the previously mentioned enclave. From this village, with a bar and fountain, they can appreciate the shrine of the Virgin de la Peña, (the virgin of sorrow) carved into the mountain. After leaving the village, hikers should continue a track to the left that will lead them the short walk, to Villambistia (22.8 kilometres to Agés), the second stop on this route. Here they will find, the XVIII century church of San Esteban and in the village a hostel, and a legend which claims that the water flowing from the village four-piped fountain has magical powers (not drinking water). According to history, to restore vitality and to cure tiredness the hikers should soak their head in it. Approaching to Espinosa del Camino Just in front there is a playground, and a fountain, from which the water is drinkable. The route abandons this hamlet after a short climb and arrives at a junction with the N-120, quite dangerous owing to poor visibility and its location on a dip in the road. The Camino then continues on the right hand side of the road, accompanied by advertisements for catering establishments, already announcing the arrival to Espinosa del Camino (20.7 kilometres to Agés), the third stop on the journey. Here, even early risers will find establishments open for breakfast from 07.00 hours, as well as a fountain with drinkable water. Also, and next to the hostel (San Roque), built on the former private hostel La Campana (Knock on the door, it is the one with the lead soldiers). 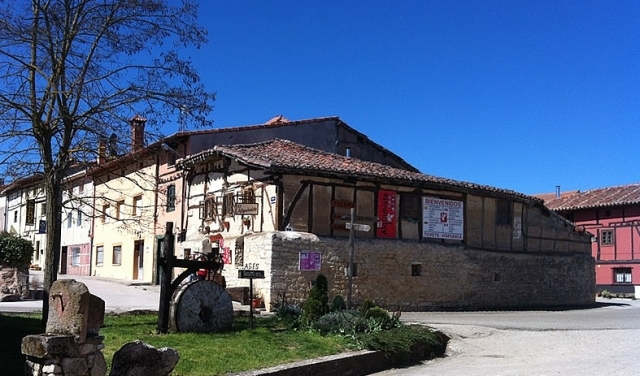 The journey then continues along a route that crosses a small hill until arriving at the ruins of the mozarabic monastery of San Félix, where tradition places the remains of the Count Diego Rodríguez Porcelos, the founder of Burgos. After reaching another junction with the national road and avoiding it thanks to a narrow path that circulates on its right side, the route approaches Villafranca de Montes de Oca (17.7 kilometres to Agés), one of the Jacobean milestones of the day, where pilgrims are conveniently recommended to replenish supplies as there remains more than 12 kilometres and continuing ascends to San Juan de Ortega, the next enclave with facilities. On a stop, just before the ascent, many pilgrims visit the Church of Santiago El Mayor (late XVI century), where they keep a baroque carving of the Apostle and a baptism basin made from a large natural shell. After leaving the temple on the left (which states no camping in this area), a steep climb begins, on which is situated what was for centuries the pilgrim Hospital of the Queen and of San Antonio Abad. This institution, founded in the 1380s by the Queen of Castilla, Juana Manuel, still survives despite being reformed. Currently it is a hotel (San Antón) that offers a pilgrim menu. Between the river Ebro and the river Duero Aside from this establishment, the route continues towards Montes de Oca, some legendary landscapes, evocative and feared during the Middle Ages because of the presence of robbers, whom protected by the dense surrounding woods, assaulted pilgrims. The Códice Calixtino refers to this place as Nemus Oque. Today, however, solitude and silence presides this walk and offers the pilgrims beautiful surroundings, situated in the northwestern corner of the Iberian region, the natural division between the rivers Ebro and Duero. Meadows of beech trees and extensive masses of oak trees, next to juniper bushes and ash trees that serve as shelter to a number of animals such as deer, wild boar and mountain cats. The climb begins on a steep, rocky and narrow path, which gradually moderates as they continue. Even then, effort is not reduced until a little more than 1.5 kilometres after arriving at a picnic area and a viewing point over the sierras of San Millán and La Demanda. In this place they will also find the fountain of Mojapán of untreated water. After continuing the forest track and gaining altitude bit by bit, the path reaches an antenna and, a little later, a monument erected in honour of those killed in the Civil War. Two difficult slopes, one descending and the other ascending 100 meters, will test the strength of even the strongest hikers. In between, and over a small bridge, hikers cross the river Carratón. After this hard step, the pilgrims continue the climb, now with moderate slopes, to the summit of La Pedraja (1.150 metres), the highest point of the day. In winter, the cold summit can take its toll on any traveller. By contrast, on the long stretches with no trees, the summer sun can also become a clear enemy. Another difficulty of the day is the lack of signposts, which can lead to confusion regarding the remaining journey. The gravel path gives way to a wide forest track surrounded by a forest of pine and oak trees through which, they reach a gentle descent to San Juan de Ortega (4.5 kilometres to Agés), another Jacobean enclave of this day. This Saint (1080) became a collaborator of Santo Domingo and gave his live to the task of helping the pilgrims to construct a number of roads and bridges. His main piece of work, however, in this village was the construction of a church dedicated to San Nicolás de Bari (XII century) and a small monastery. In this enclave the walkers can visit the tomb of the saint and behold, just two days a year, the equinoxes of spring and autumn known as the Miracle of light. A ray of sun enters through a window and falls neatly on a Romanesque capital in which they will find a beautiful sculpted representation of the Annunciation of the Virgin. On the way out of San Juan de Ortega, after a short stretch on asphalt they come to a crossroads with many signs from which large wooden cross stands out. To reach Agés they must enter a dirt track that passes through a pine forest rich in mushrooms. The collection of these fungi is regulated, and only allows those that have a local license to pick them. With the disappearance of pines they will discover magnificent views over the fields of Burgos. Walkers should not get lost from here. But just in case, the few trees found at the foot of the Camino are light up with yellow arrows that lead the way. The terrain is very comfortable to Agés except for a small slope at the end of the journey, which again includes a few loose stones. This day does not pose many problems for cyclists. Only the hard and rocky path that begins after the church Villafranca Montes de Oca and the descent and climb just after a memorial in respect for those who died in 1936 may require extra effort. In this section, the view from the bike is eye catching. Cyclists face, at great speed the descent as they near the previous mentioned antenna, while the walkers suffer to reach the summit of the previous ascent. On the gentle path to Alto de la Pedraja, and after a period of heavy rain, muddy terrain may complicate the journey. In bad weather another option to avoid the most complicated sections is to continue the ascent from Villafranca via the N-120 until reaching a picnic area from which they can deviate to the right to reach a small chapel and join, once again the ancient route. No estoy cabreado, pero que se entere todos, que el camino existe gracias a nosotros, LOS PEREGRINOS, no a la gente que se quiere aprovechas de las circunstancias. 1 reviews Distance to Santiago: 531 km. 1 reviews Distance to Santiago: 519 km.